Robots are getting pretty good at carrying on after taking a knock, but what if they lose a limb? Scientists from the US and France have given a six-legged 'bot the smarts to keep going even if two of its legs are disabled by, say, a Sarah Connor shotgun blast. 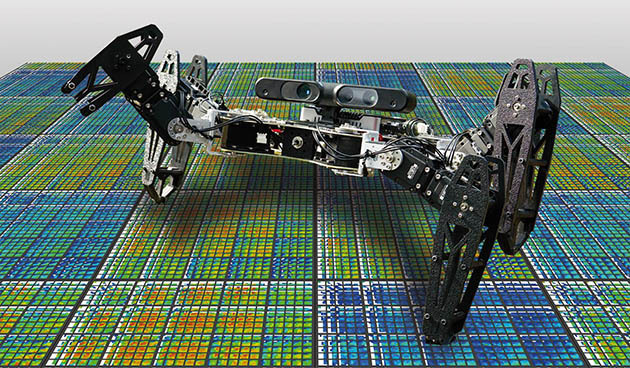 The team created and then rated a number of simulations for how its robot could keep moving forward despite losing a leg or two. Once that information was programmed into the robot, it was able to rapidly evaluate the options and use the one that worked best in the real world. Calling it "intelligent trial and error," they described the programming as a kind of intuition for robots. "These predictions come from the simulated, undamaged robot. (However) it has to find out which of them work, not only in reality, but given the damage," according to lead author Antoine Cully. He added that the same algorithm also lets the machines adapt to new situations and environments. The researchers think the bot could one day be useful as a rescue aid or personal assistant, and expect to see similar robots that can adapt to adversity or even fix themselves. NASA, for one, will need them for future Mars missions.